If you have arrived here from the talented Judy's blog then you are hopping in the right order, if not, please go back to the FUSSY & FANCY BLOG CHALLENGE to hop in the right order. For me, Spring Colours is all about the flowers especially the bulbs that have been under the soil through the Winter months and suddenly they pop through and burst into beautiful coloured flowers, the first through in our garden are the daffodils but I look forward to the brightly coloured Tulips..so when I spotted these tulips in my silhouette design section I had to download them. I experimented with the colours. This card has been inspired by a very clever card that my Facebook friend Linda Page had made if you would like to know how the box was made you can find out on Linda's blog here her instructions are very clear and she makes it surprisingly easy ....so thank you Linda. As a special bonus for my followers old and new I am offering some blog candy! I have included some diecut decoupage, lovely glittered and blinged butterflies, some pretty paper flowers and even the ribbon and tag are reusable. Well that's all from me for tonight. I do hope you go on to complete our Blog Hop and maybe even enter this very special Fussy & Fancy Challenge yourself. Just BEATUTIFUL Annie...what a wonderfully fun and lovely Spring box!!! I really need to try one of these!! Happy Spring!! 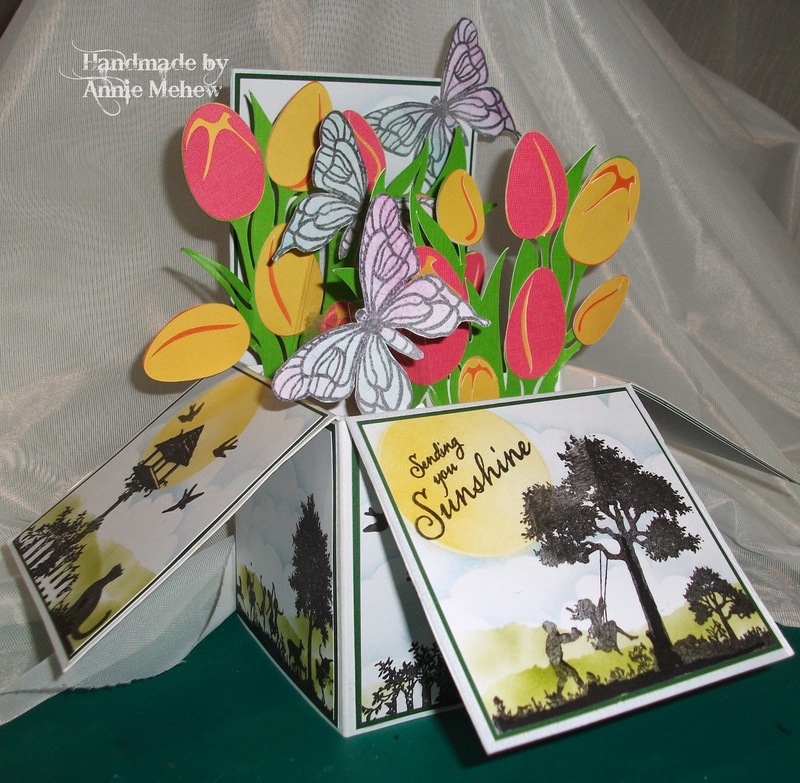 I really love this Foldable 3D spring box. The different scenes on each panel look great. Awesome candy too. I am your new follower. WOW!!! This is gorgeous!!! I LOVE the box. I have never seen this before. What a fun idea! I can't believe it folds flat the way it does. That would be such a nice surprise for the recipient of this card! I, too, think of flowers when I think of spring. Thank you for this lovely inspiration. Ah can't wait to try out something like that! Looks absolutely stunning! 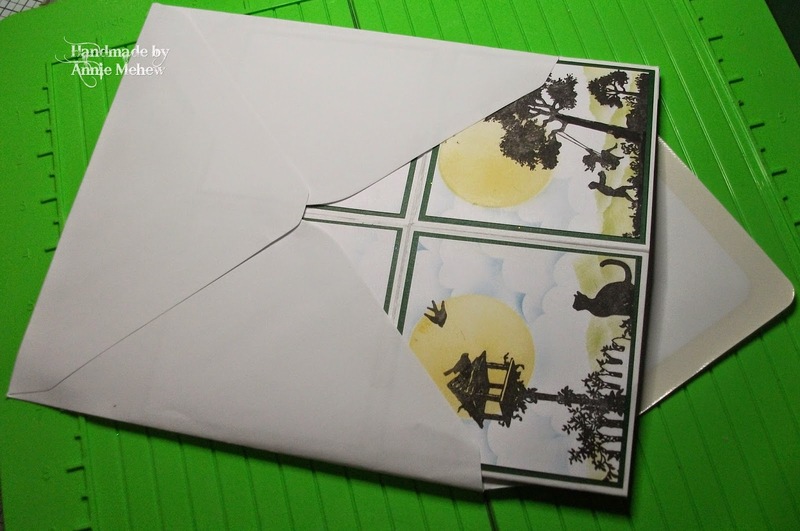 Your pop-up box is beautiful! I keep saying I'm going to make one of these - I have a template so I don't know what I'm waiting for! 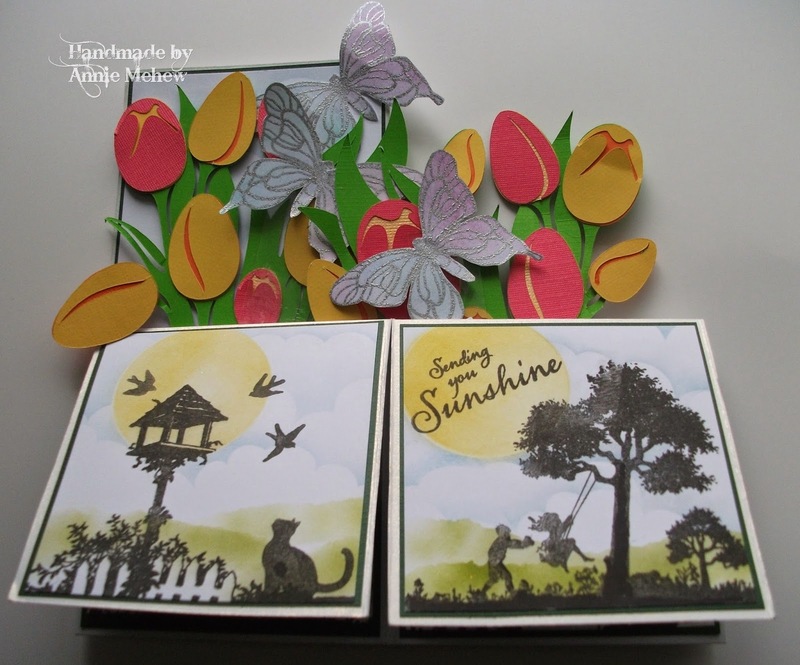 Yours is so lovely with the butterflies and tulips - love the images on the sides too - especially the kitty! I am your newest follower - I appreciate your candy! I am joining in the blog hop today - thank you for the fabulous inspiration! I love your 3d box, beautiful!!! So great that it can be posted. Always nice with a blog hop, you get so much inspiration! Great idea! Love the box and the blog hop! Pop over to mine and say hello!!! This is just stunning Annie - love the silhouette scenes on the base as well as those beautiful tulips! I love your gorgeous box! The silhouettes are beautiful! Hi Annie, I'm hopping! I love your pop up box, I haven't yet tried one, yours is beautiful! Fabulous card, Annie. I'm seeing this card-in-a-box style everywhere now. Haven't tried making one, but it's on my to-do list. Terrific job you did. I love the silhouette images. Thanks for the chance to win your lovely candy, I am following via Bloglovin. Wow Annie~~This card is a TREASURE!!! What awesome detail and talent!!! Oh My!! Beautiful box card!! I have seen a lot of these popping up on blogspots...I have got to try one!!! Your card box is beautifully done!